Bringing rich “home theater” quality sound and wireless Bluetooth¹ audio connectivity to your avionics stack, the GMA 345 digital audio panel offers a superior inflight audio experience at an affordable price. Featuring 3-D spatial sound processing, a USB charging port, marker beacon receiver, advanced Auto Squelch, clearance playback and impressive audio mixing and distribution features, this all-digital unit offers the ideal blend of capabilities for pilots who want to hear and do more with less effort in the cockpit. Plus, it’s an easy slide-in upgrade from select third-party audio panels or legacy GMA 340 units. - Built-in Bluetooth connectivity makes it easy for you to wirelessly pair your smartphone or other compatible device with the audio system. So, you can make and receive calls in the cockpit, as well as stream audio entertainment through as many as 6 headset positions in the aircraft. The powered 2.1 amp USB port on the unit’s faceplate helps keep your phones and mobile devices charged. 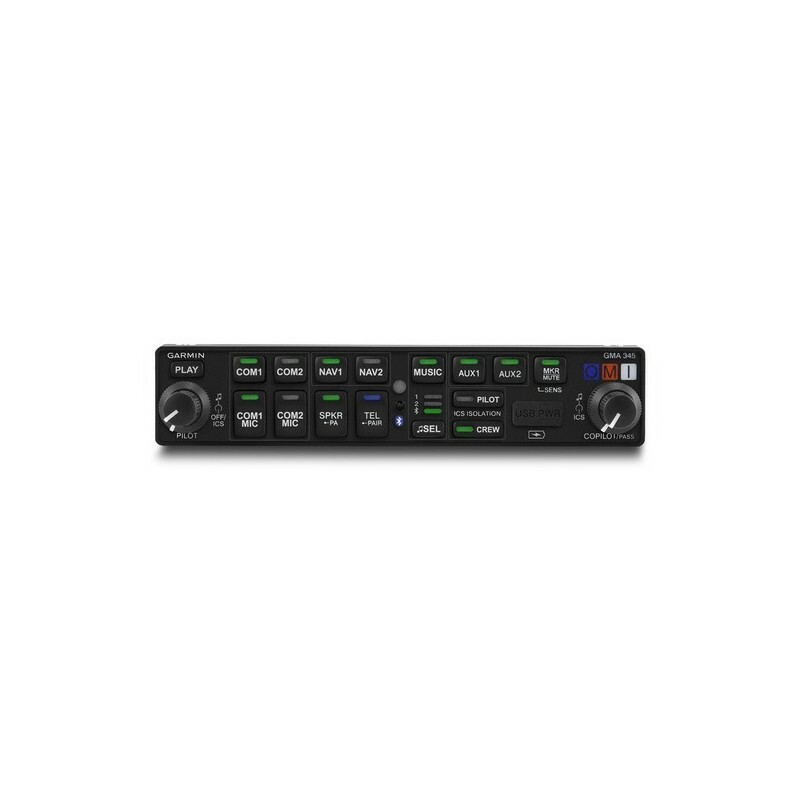 Moreover, GMA 345 features 2 dedicated rear audio connections, allowing hardwired sources — such as SiriusXM® satellite radio or other high-fidelity music inputs — to be played and distributed through the audio system. Music effects also add to the rich audio experience provided by GMA 345. You can select enhanced bass boost levels as well as equalizer effects that include rock, classical and pop audio profiles. - For your radio communications, advanced 3-D digital sound processing, first introduced to general aviation by Garmin, enables GMA 345 to approximate how the human ear normally hears and registers multiple audio sources in space. With stereo headsets, incoming audio is spatially separated to reflect how different audio sources are coming from different directions around you. This makes it easier to distinguish one source from another — and helps you focus on the higher-priority calls coming into your headset. For example, COMM 1 will seem like it’s coming from the left while COMM 2 will seem to be coming from the right. - Think high-end music equalizer and exceptional “home theater” quality sound. That’s what the GMA 245 audio panel brings to inflight media and entertainment. The audio panel provides support for 2 dedicated stereo music inputs — plus additional Bluetooth wireless devices — which can be played through the headsets. Music features allow pilots to select enhanced bass boost levels as well as equalizer effects that include rock, classical and pop audio profiles. - An automatic digital voice recorder on the audio panel continuously captures the last 60 seconds of incoming active comm audio for instant playback on request with a single button press. Any pilot who’s ever missed an ATC call, frequency assignment or clearance amendment will appreciate the value of this handy “say again” function. - At full capacity, GMA 345 will support dual comm, dual nav and multiple aux receivers — totaling up to 7 radios. There’s a 6-place automatic VOX intercom with 3 modes of isolation. And a split-comm mode lets the pilot and copilot broadcast on independent frequencies. For example, the pilot can use COMM 1 while the copilot uses COMM 2. - To further enhance the cockpit audio experience, advanced Auto Squelch technology on GMA 345 automatically adapts to a quiet or noisy environment without clipping words or cutting out during conversation. A high-performance digital signal processor constantly monitors ambient noise level and automatically adjusts the mic squelch level required to keep intercom conversation as comfortable and natural as possible — whether you’re talking over engine noise in flight or quietly going through your preflight checklist on the ground. The unit’s Auto Squelch technology automatically adjusts for these variances, allowing you to speak at normal levels, no matter what the ambient sound conditions may be. - GMA 345 can pair via Bluetooth with the VIRB Ultra 30 series of HD action cameras — allowing you to overlay intercom audio and ATC communications on the HD inflight video you’re shooting. Since there’s no headset audio cable required, your VIRB action camera is free to move about the cabin so you can shoot from the best possible angle. 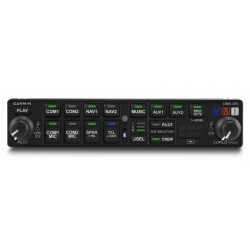 - Upgrading the audio experience in your cockpit is easy with GMA 345. It’s fully rack-and-pin compatible in dual-Comm installations with the Garmin GMA 340 as well as select third-party audio panels. So, it doesn’t take long for your installer to pull out the old and slide in the new. The audio panel’s built-in intercom and marker beacon help further reduce installation time for the system. And since it can operate on either 14 or 28 volts, there’s no need for any external voltage regulators or the wiring that goes with them. Fast, easy, affordable — that’s the GMA 345 audio upgrade path..